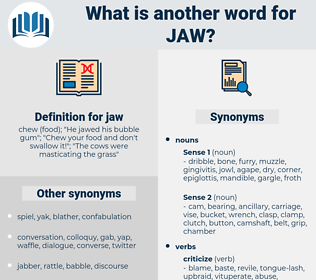 What is another word for jaw? 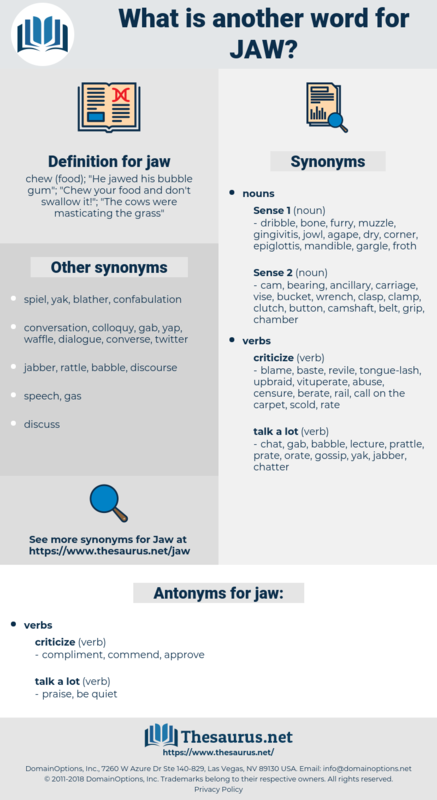 chew ( food); " He jawed his bubble gum"; " Chew your food and don't swallow it! "; " The cows were masticating the grass"
The jaw quivered a little as though with some intense suppressed emotion. By the set of Old Hickory's jaw I knew he was puttin' something straight up to Rupert. pair of pliers, plyers, wrench, alligator clip, pliers, spanner, chuck, vise, bulldog clip, bench vise. lower jaw, jawbone, maxilla, mandibular bone, submaxilla, upper jaw, chop, lower jawbone, jowl, mandible, upper jawbone, maxillary, mandibula. alveolar ridge, gum ridge, alveolar arch, alveolar process.